Bubbles Blinds not only offers the standard vertical headrails in a choice of colours, but also sloping headrails, ideal for sloping sides of conservatories, and curved headrails that fit perfectly into bay windows. The vertical blind still remains the preferred blind for lots of people, with it''s ever increasing choice of fabric, colours, textures and patterns. Vertical blinds are still one of the best light control products on the market today and by nature of their operation stay remarkably dust free and clean. All vertical louvres come in 89mm widths with a good number also coming in 127mm widths. Headrails come in a choice of colours, white, brown, black, gold and silver. Bubbles Blinds offers a choice of over 300 different fabrics, textures and patterns and is constantly looking to source new products and ranges of good quality and price. 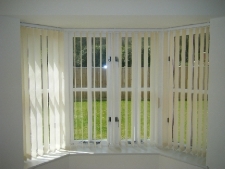 We also offer a choice of control and bunch sides to dress your windows to your taste.